Ordinarily, I don't pay much attention to split albums, and I'm not really sure why that is. You're basically getting a couple of EP's on a single disc, so why do I so often avoid them? Part of the problem is that rarely have I heard a split where the two (or more) bands actually complement each others' music or sound like they have much in common thematically. A lot of times I'll enjoy one band and dislike the other, so when I do buy a split, it's often because I just want to obtain material from a band that I can't get on any of their other releases. In this case, I am a pretty big fan of both bands involved, so purchasing this split CD was an easy decision to make. Chur impressed me quite a bit with his debut album, Brother Wind, which I discovered in early 2007 and bought basically because I thought the cover looked "folkish." It turned out to be one of my more pleasant surprises that year, a rather mature and focused debut CD, with great vocals and folk instrumentation. However, I found his half of this split to be very disappointing. The two elements I enjoyed most about Brother Wind, the vocals and folk instruments, are nowhere to be found on these four tracks. Instead, we are given instrumental songs. Not that instrumental is necessarily bad (see early October Falls, Drudkh's Songs of Grief & Solitude, and most of Ulver's Kveldssanger for examples of this), but these aren't atmospheric acoustic songs or anything. They're mostly constructed of electric guitar and drum machine, and the overall feeling I got was that this was some guitarist's demo that he hands out to bands he's trying to join. There are words (lyrics?) printed in the booklet, which almost gives me the impression that either Chur ran out of time before he could record vocals, or that someone at Stellar Winter accidentally included unfinished demo versions of the songs on the CD. In all likelihood, however, this was intentional. And I'm sure Chur knows what he's doing, but after repeated listens I'm still not really digging it. It just sounds like instrumental metal, which is something I'm not interested in. In the case of Oprich, I didn't really know what to expect. Their only previous release is a split with Kroda. 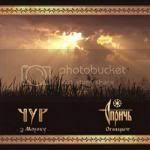 That split is mostly notable because of Kroda's side, featuring the awesome two-part "Poppyfields Are Blossoming," but I feel that Oprich's contribution, the five-track mini-album Wolfen Loyalty, is an underrated and interesting bit of folk metal. It's certainly strange, especially the first two tracks, which is probably where many listeners gave up on it. The production is rough and inelegant, and certainly the overall sound is an acquired taste, but it grew on me after a while. Oprich is perhaps better known (and respected, if by proxy) because of the band Vo Skorbyah, a project that mostly consists of Oprich members. Vo Skorbyah garnered strong reviews and a fair bit of attention from fans of underground metal after its self-titled debut CD was released last year, and it seems its success convinced the folks involved to keep the project going, despite their original intention for it to be a one-off. I'm happy to report that Oprich's side of this split fares quite well. The band is still "quirky," and some listeners will probably still dislike them, but their four tracks are a definite improvement over Wolfen Loyalty, in my opinion. The production is much cleaner and the band sounds much more confident and mature this time around. The harsh vocals from Wolfen Loyalty have disappeared, yet there are still multiple sets of vocals to be heard. Vocalist Zhdana and violinist Vasilisa seem to be nowhere to be found, and the former is replaced on this release by two (session?) female vocalists, Nina and Maria. Yaromir, Rodoslav, and the now-departed Bersen tackle the rest of the vocals. Having five different vocalists on a four-song mini-album lends their half a lot of variety, perhaps at the expense of cohesiveness. It would be difficult to tell that each track is by the same band, because they sound so much different than one another. The first Oprich track, "As in the Distance," is the least interesting to me, but the remaining three are all great. I don't think Rodoslav (founder of pagan neofolk band Krynitza and a member of Vo Skorbyah) was on the previous Oprich release, but he handles lead vocals on the final track, "Don't You Murmer, Mother Green Oaken Grove," and I'm a big fan of his unique vocals so this is was a treat for me. I feel that Oprich has redeemed themselves (if indeed they needed redemption in the first place) with The Fireflower, and I certainly hope their next project is to create a full-length album. They've been around since 1998, so I think it's due. As for Chur, he's been signed to Hammermark Art Records (home of Kroda) and is currently working on his next full-length, and judging from the few samples on his website, it sounds like it's coming along quite well. It would seem that ...From the Ghostly Fog... is just an unfortunate misstep. It's difficult for me to recommend this CD because of how disappointed I was in Chur's contribution to the split, but Oprich's half makes me glad I made the purchase. I'm not sure if that's a recommendation or not, but take it or leave it.